This briefing is an accompaniment to a call issued by Palestinian agricultural organisations for action to end trade with Israeli agricultural companies. Palestinian farmers face the brunt of Israel’s land confiscations, demolitions and water theft. Farmers that still have access to land and water face systematically implemented restrictions and violence. Israeli agricultural export companies such as Mehadrin and Hadiklaim are among the primary beneficiaries of the destruction of Palestinian agriculture, operating inside and exporting produce from illegal settlements using stolen Palestinian land and water and profiting from the siege on Gaza. 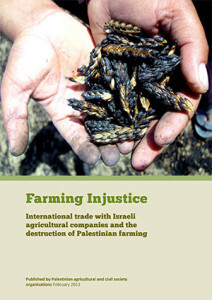 This briefing, published by Palestinian agricultural and civil society organisations, aims to shed light on the systematic destruction of Palestinian agriculture by Israel and the complicity of Israeli agricultural companies in this destruction.